1. Take a pan, add 25 grams gram flour and dry roast until it turns dark brown in color. 3. Take 500 grams paneer and cut it into large cubes. Keep aside. 4. In a mixing bowl, add 1 tablespoon oil, 1 teaspoon paprika and mix it well. 5. Add 150 grams hung curd, 120 grams fresh cream and mix it again. 6. 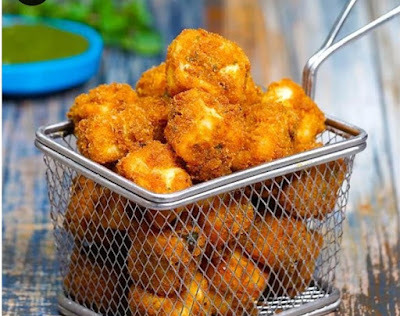 Add 1 tablespoon ginger garlic paste, 1 teaspoon coriander powder, 1 teaspoon cumin powder, 1 teaspoon garam masala, 1 teaspoon dry mango powder, 1 teaspoon black salt, 1 tablespoon dry fenugreek leaves, 1 tablespoon roasted gram flour, 1 1/2 teaspoons salt, 1 1/2 teaspoons coriander and mix all the ingredients well. 7. Now, add 500 grams paneer and mix it well. 9. In a blender, add 100 grams corn flakes and blend it into a fine powder. 10. Transfer this into a bowl, add 100 grams bread crumbs, 1 teaspoon salt, 1/2 teaspoon red chili and mix it well. 11. Roll the paneer into this mixture. 12. Heat sufficient oil in a fryer and deep fry these until it turns golden brown and crispy. 13. Drain it on an absorbent paper. Keep aside. 1. In a blender, add all the ingredients and blend it into a smooth paste. 2. Serve the paneer tikka popcorns with prepared chutney.